Doing a new set of twists. 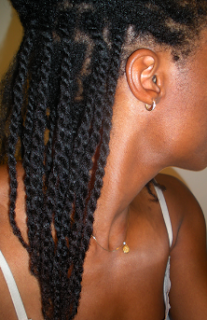 I wore the loose twists for almost two weeks then undid them, washed, conditioned, and detangled. After that, I air dried in rollers again and put in another set of loose twists. 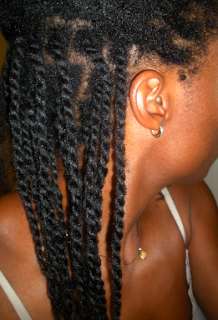 I wasn't quite feeling them this go around, so after a couple days, I transitioned to my usual twists. I'm in week #2 and plan to keep them in for a total of three weeks. Now for my new detangling method. As an effort to get to hip-length (HL) sometime late next year, I knew that something(s) in my regimen had to improve ... one being that I be more patient in my detangling method. As my hair got longer, detangling sessions obviously became more tedious and opened the door to a bit of impatience on my part. I did not notice the effects until I started monitoring my front hair over a couple of years. (Check this earlier post for more details.) Once I became more patient with that section (and gave myself a fresh trim), it flourished! And here I thought my bangs had reached their terminal length. Finger separate on dry, lubricated hair + Finger detangle on damp, conditioner-soaked hair. In all honesty, doing a full finger detangling on dry hair prior to washing just doesn't work for me and does my hair more harm than good. However, finger detangling on damp, conditioner-soaked hair has been working really well so far. The catch? My hair cannot be too tangled beforehand. That being said, I've haven't tried this on hair that has been twisted for the long-term, so the story could be different in that case. Right now, my experiment is to thoroughly finger separate each twist after pre-pooing overnight with coconut oil, put my hair into 8 big braids, wash, then whip out the conditioner and do the full finger detangle. From loose twists to my usual "traditional" twists. Done. Will wear for three weeks. I love your hair! Hoping to get your length in a few years.. So finger detangling has worked for you? 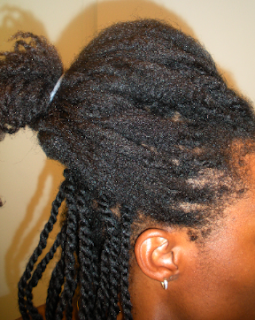 I would assume the key is to wash somewhat frequently (every 2 - 3 weeks) and make smaller twists and lather them in conditioner? My hair gets crazy SSKs whenever I do smaller twists, so I don't do them often. This size works better for my ends. But yeah, what you suggested would be my ideal if not for the SSKs. I REALLY wish I could get my twists to last! My hair starts getting really frizzy after a few days like I've had them in for weeks and it's so annoying! Lol. I get SSKs too. I generally just get rid of them with a pair of scissors. I don't have a lot of time for hair but I can usually braid within three hours after washing and detangling. And I make my own products in about two hours. I use a comb to detangle now but I wonder if it leads to broken strands and more shedding or tangles. But I don't know what else to do that is feasible. It's funny how making one small tweak can improve your entire routine. I had to give up combs, too, even the wide tooth ones. They just did too much damage to my hair. I used to have hair this length and then I relaxed and was relaxed for about 6 years and in that time my hair got thinner and shorter and I failed to take care of it. Now I am natural again about 2 and half years but finding that my hair is just not growing at all. The culprit may be that I dyed my hair or my diet. My hair just sheds like crazy. It's so discouraging and I am trying to be patient because I really want my old hair back, not just the length but the thickness and the health. I'm trying to do more protective styling but I feel I won't get back what I had. But, I'm back on the workout wagon, cleaning up my eating every day, and not surprisingly, my hair has turned around and followed suit. My length retention finally seems to have busted through the plateau that plagued me for over a year! Just wanted to say thanks for always being such an inspiration! Like you, I'm also targeting the end of 2014 to reach hip length-- or at least get pretty darn close-- so let's DO this!